Two years ago, I reviewed a charming Cary Grant-Katherine Hepburn movie called Holiday. It was one of the four movies in which the two starred. 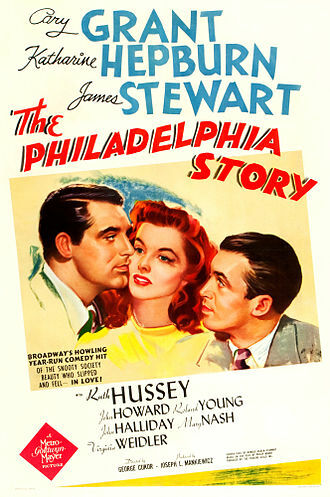 While Sylvia Scarlett was the first of the lot, and a massive box-office disaster when it was released, the other three (Bringing up Baby, Holiday and The Philadelphia Story) fared better. The last named, in fact, was a thundering success, both critically and commercially. While fellow blogger Dustedoff has reviewed Bringing up Baby, I’d fully intended to review The Philadelphia Story immediately after I’d reviewed Holiday. For some reason, I didn’t, then. 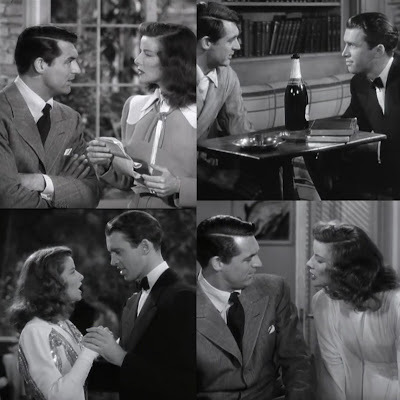 So now, being on a Cary Grant kick (as I once was, before), and this came up on the sidebar while I was watching The Awful Truth, I decided it was time to have a re-watch prior to writing it up. The film opens with CK Dexter Haven (Cary Grant) walking out of a grand mansion in a miff. Following him is his solicitous wife, Tracy Lord (Katherine Hepburn). While her mother disagrees, she points out that she did just what her strong-willed daughter had wanted her to do – kick her husband to the kerb. Tracy is sure she did the right thing; that’s the only thing a woman could do and still keep her self-respect. Her mother is still unsure – she now has her self-respect, but no husband. While Tracy has no regrets over her first marriage ending, her younger sister, Dinah (Virginia Weidler), is still very fond of Dexter. She is also very upset that Tracy will not invite her own father to the wedding. That’s because Tracy holds herself to the highest standards, says Margaret, and other people don’t often live up to them. That’s not much consolation to Dinah who rues that nothing ever happens here (she’s hoping something will stop the wedding). Morosely, she joins her sister at the stables where her fiancé is waiting for her. George Kitteridge is a social climber, and is hoping that his wedding into one of the oldest aristocratic families in the area will help his political ambition. Liz is even more matter of fact: ‘I can’t afford to hate anyone,’ she says. ‘I’m only the photographer.’ Kidd is uninterested in whether he’s liked or not. What he wants is exclusive coverage of the high-profile wedding and he’s going to get it. While Connor is righteously indignant (It’s degrading! ), Liz is pragmatic – ‘So is an empty stomach.’ But. How do they get in? Kidd is all smiles. His ace-in-the-hole is CK Dexter Haven, the rich Ms Tracy Lord’s ex-husband. Dexter works for Spy in Buenos Aires, and is intimately acquainted with Junius, Tracy’s brother. He will introduce Mike and Liz as Junius’s friends. Mike assumes that Dexter is doing this to get even with his ex-wife. Dexter doesn’t bother to explain. The next afternoon, he brings them up to the manor, and asks the butler to show them into the South Parlour, while he goes off to surprise his ex-wife. Left alone in the parlour, and more than slightly discomposed by the grandeur surrounding them, Mike makes snarky remarks about the Lords and their upper class privilege. Liz is too busy taking photographs. Meanwhile, Dexter has tracked down Tracy and Margaret, and is greeted rapturously by Dinah. Margaret, once she is assured that he hasn’t come to disrupt the wedding, is equally welcoming of him. Tracy is the only one who wants him to go back where he came from. Dexter quickly informs them why he’s there; Junius can’t attend the wedding; he’s heartbroken. But he’s sent two of his friends, and they need to stay in the house. Tracy knows he’s lying ('I can always tell,' she tells him). As she plans to call Junius and then throw Mike and Liz out (she knows Dexter is working for Spy), Dexter confesses. No, not to doing it for himself; he’s being blackmailed. Kidd has a story on Tracy’s father and a dancer, complete with photographs. The gossipy article is ready to be published and can only be stopped if Tracy allows Spy to have complete and exclusive coverage of the wedding of the season. Tracy, who deeply resents her father’s infidelity, is sick to the core, but her overarching need to keep her family’s reputation intact causes her to agree, though she doesn’t promise that the reporters are going to enjoy the ride. Dexter has no time to assuage Mike’s prejudices, and his response only underlines the difference between the two men. If all the evidence of wealth around them was not enough, Dinah waltzes in, dressed to the hilt, speaking in French ('I spoke French before I spoke English'), playing little lady of the manor to the hilt. With many flourishes of speech, and much pointy-toed walking, she even regales them with a piano performance. While Liz and Mike are still trying to make sense of the whirlwind, Tracy rushes in, even more Gallic. She too comes across as an empty airhead, full of nothing-sayings, and she talks so much that neither Mike nor Liz can get a word in, edgeways. Soon, she goes looking for her ‘mama’, and Mike is left wondering who is interviewing whom. The Lords’ act continues with Margaret, all gracious and gushing and playing to the gallery of Mike’s prejudices. George’s arrival lets Liz take some photographs, but it is with the entry of Tracy’s uncle (Roland Young), that things begin to get interesting. Tracy promptly introduces her uncle as her father, much to his bemusement and her mother’s shock. Her uncle plays along, fortunately, and so do Margaret and Dexter. Dexter also gives Liz plenty of photo opportunities, much to Tracy’s chagrin. She manages, however, to ‘accidentally’ break Liz’s camera. I’d a feeling that would happen,’ says Dexter. There’s trouble on the horizon, however – the real Seth Lord is back. Thinking quickly, Tracy promptly welcomes him as ‘Uncle Willy’ though she’s still at daggers drawn with her father. After lunch, Liz drops Mike off at the town library so he can do some background research on the Lords. While there, he bumps into Tracy, who’s doing her own research. She’s beginning to see him in a new light, and Mike is beginning to see what his prejudices stopped him from seeing – the sensitivity under Tracy’s tough exterior. She can empathise with him, and suddenly, he’s beginning to empathise with her. As they walk home together (Mike having completely forgotten both research and Liz), Tracy is beginning to learn about a world so different from hers, Mike is seeing a real person instead of a stereotype, and their newfound understanding is breaking the walls of both pride and prejudice. Deciding to take a swim, Tracy is delighted to offer what she thinks will solve Mike’s problems, an empathy that Mike finds deeply patronising. Before they can bridge that misunderstanding, Dexter arrives at the pool. Dexter’s hurt and bitterness escape from under the cutting banter, but only for a moment. But it leaves Mike feeling deeply uncomfortable, while the bitter truth under the hyperbole cuts Tracy to the quick. But Dexter is not contemptuous of her; he’s contemptuous of her intolerance for human frailty, for any weakness at all. Besides, all he had come for was to give her his wedding present. Tracy is shaken but George doesn’t understand her confusion. Unfortunately for Tracy, that’s not the end of her troubles. Her mother seems to have happily accepted her husband back, and when Tracy objects to his waltzing in and taking over the ‘head of the family’ status, she is told off by a man who makes no apologies for his philandering. His reasoning smacks of self-justification, and by the time he accuses his daughter’s lack of understanding for his straying ‘in search of his youth’, she is both furious and near tears. (This scene nearly made me break out in hives.) Amidst all that rationalisation, however, is one truth that Tracy can no longer deny. She’s forced to see herself as others see her, and she doesn’t like the picture. The only person who has a kindness for her that horrid evening is Mike, who wonders where Tracy is. ‘If you ever happen to find out…’ says Tracy, with a weak smile. ‘I’ll be sure to let you know,’ responds Mike, gently. As the evening progresses, she’s getting more and more drunk. So is Mike. As Kitteridge whisks Tracy away from a ‘very attentive’ Mike, the latter grabs a bottle of champagne, two glasses and, getting into one of the family’s cars, asks the driver to take him to Dexter’s house. There, after telling the driver to go back home ‘before he turns into a pumpkin and six white mice’, he proceeds to wake Dexter up. Dexter’s confusion turns into amusement when he realises his uninvited guest is dead drunk. He’s come to talk to Dexter, Mike slurs, and Dexter, trying not to smile, invites him into the ‘talking room’. [This leads to a great scene, where James Stewart, improvising, decides to burp after taking a drink; Grant, playing along, laughingly says ‘Excuse me’, thinking Cukor would cut the scene out. Instead, Cukor loved it so much, he kept it.] Mike looks around like a bleary owl, and spotting his book, is amazed at finding unsuspected depths in a man he had ridiculed as a dilettante. ‘But did you read it?’ he asks, owlishly. A v-e-r-y interesting (to Dexter) conversation ensues, and when Liz (with a very drunk and very sleepy Tracy) turns up to 'take Mike Connor's body home’, she is enlisted ‘to commit suicide’ while Mike goes home with Tracy. Despite their condition, Tracy manages to drive home safely. Their party hasn’t ended, however. Moonlight and champagne make a very deadly combination, as Tracy is about to discover. And it is that, that is to prove her undoing. Will Dinah torpedo Tracy’s wedding plans as she wants to (even hoping to catch smallpox if it will postpone the wedding)? Or will Tracy do it all by her own self? And which of these three men does she really love? Who really loves her, not an idealised version of womanhood? The sparkling wit of the dialogues and the absolutely crackling chemistry between Katherine Hepburn, Cary Grant and James Stewart, along with the authentic representation of the cream of Philadelphia high society, make The Philadelphia Story a fabulous watch. Screen writer Donald Ogden Stewart (no relation to Jimmy) brought to life Philip Barry’s delightful play of the same name, and the friendship amongst the three leads shows in the comfort they share in their scenes together. Whether it is Hepburn and Grant, or Grant and Stewart, or Stewart and Hepburn, there’s no trying to outdo the other, or to steal the scene. [Hepburn had originally wanted Clark Gable and Spenser Tracy, and may I say I’m glad they had other commitments?] In fact, some of their scenes together were adlibbed, and the on-the-spot improvisation had the benefit of not only being humorous, but also completely natural. Or when Mike confronts Dexter: at one point he says, ‘By god, Dexter, either I will sock you, or you will sock me!’ And Dexter responds: ‘Shall we toss for it?’ Much later, Dexter does end up 'socking' Mike. In lesser hands, this scene – a ‘drunken confrontation’ scene – would fall flat; in the hands of Stewart and Grant, it is comic gold. They play off each other’s strengths, Stewart with the goofiest grin on his face, and Grant looking honest-to-goodness amused, and one can’t help but laugh at the absurdity of a man drunkenly confronting an ex-husband for not treating his ex-wife ‘like a queen’. Tracy Lord is not very likeable. Her first marriage fails because she is too demanding of perfection. As her younger sister says at the beginning [when their mother ruminates over where to put over a 1000 people if it rains on the day of the wedding], ‘It won’t rain. Tracy won’t let it!’ She ‘married on impulse and divorced in a rage’ says another character. So when she learns what it is like to be flawed, when she learns that she’d much rather be human than a ‘goddess’ or a ‘queen’, it’s as much a surprise – not always pleasant – to her, as it is to those who love her. Katherine Hepburn played her to perfection. Indeed, she claimed that Tracy was as close to her as could be. [Writer Philip Barry had based his Tracy on one of Philadelphia’s well-known socialites – Helen Hope Montgomery, his best friend’s wife.] Hepburn had played the same part in the play and, along with Howard Hughes, snapped up the rights to the film. She got Cukor to direct it, in order to resurrect her career after a bout of flops that had her named in the ‘box-office poison’ list. If Tracy is all that’s wrong with privilege, Mike is the other extreme. Filled to the brim with his own prejudices – ‘The young rich rapacious American female’ he says of Tracy, without ever having met her. As Macaulay Connor, the reporter who would much rather be a writer, James Stewart shows a talent for comedy. This is probably his goofiest role yet, and he does it well. Indeed, it won him an Academy Award for Best Actor – which he was sure they gave him only because they didn’t give him the award the previous year (for Mr Smith Goes to Washington). As a man from the ‘wrong class’, he is as prejudiced and stuck up as those of the ‘upper class’; as the film progresses, he learns more about them, and himself, than he thinks. Cary Grant as CK Dexter Haven, a man still in love with his ex-wife, has the much smaller role, but was in top form here. Even without his acrobatic skills on display, he still manages to bring a physicality to his role – witness the scene at the pool where he tries to figure out why Tracy is marrying George Kitteridge. ‘He’s beneath you,’ he says, at which Tracy, properly righteous, scoffs: ‘In this day and age…’ ‘I’m talking about the difference in mind and spirit; you could marry Mac, the night watchman, I would cheer for you.’ There’s this tiny little shiver of disgust that he gives when Tracy says that Kitteridge is of ‘national importance’ that is utterly delightful, and lifts the scene from being merely emotional and dramatic. Or the scene at the end, when Mike steps in to ‘rescue’ Tracy, and Dexter’s holding his breath, because he loves Tracy, and is afraid of her response; yet, he can’t/won’t step up. Ruth Hussey’s Liz is the voice of reason, and she is also the pragmatic one. She is crazily in love with Mike, but doesn’t shirk from puncturing Mike’s intellectual (and reverse) snobbery at every turn. When Mike mocks Dexter’s name – What kind of a name is CK Dexter Haven? ­ – she tells him that she knew a plain Joe Smith once; he was only a clerk in a hardware store but an absolute rat. Liz is like Tracy – tough on the outside to hide the hurt on the inside. When she watches Tracy and Mike walk home from the library, she tells the manicurist who mistakes her sigh, ‘A little [rough], but I’m used to it.’ Her expression speaks volumes. If I could remove the Seth Lord-Tracy scene, where he practically accuses his daughter of being the reason for his philandering, I would place this film among my top ten romantic comedies. Incise that scene from memory, and the film is a blast, and with two of my favourite Hollywood stars – Cary Grant and James Stewart – at the top of their act, Katherine Hepburn the personification of Tracy Lord, and dialogues that are the intellectual equivalent of thrust-and-feint of fencing and almost as beautiful, The Philadelphia Story is good fun to watch. Again.